All of the major California sparkling wine producers now produce still Pinot Noir and the wines have become quite good. 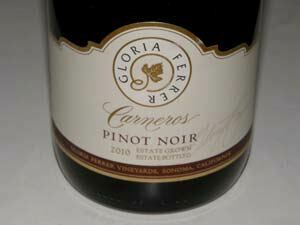 For more than 20 years, Gloria Ferrer Caves & Vineyards was the first sparkling wine house in the Sonoma Carneros region. Owned by the Ferrer family, (the founder was Jose Ferrer) whose wine experience is rooted in 19th century Spain, the winery is a vibrant blend of Catalan and California mission design. Fruit for the premium quality sparkling and still wines comes from 335 acres of estate vineyards. José, his wife Gloria, and son Pedro, came to California and bought a pasture in 1982 in Carneros, planting Pinot Noir and Chardonnay grapes in their Home Ranch and Circle Bar Ranch estate vineyards. They incorporated their Spanish winegrowing traditions and winemaking practices in creating exceptional sparkling wines. 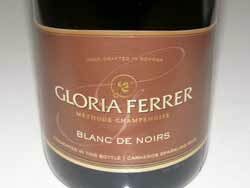 Gloria Ferrer Caves & Vineyard opened in 1986 as the first sparkling winery in Carneros. The vineyard manager Mike Crumly and winemaker Bob Iantosca, both of whom have worked for Gloria Ferrer from its inception, have devoted more than two decades to identifying the diverse soil types, microclimates and specific needs of every vine in their care. Today, Iantosca as Executive Winemaker is joined by Steven Urberg as Winemaker. In 1991, inspired by the quality and character of our estate fruit, Gloria Ferrer began crafting still wines from Chardonnay and Pinot Noir. As pioneers of sparkling wine-based clonal research, they studied more than 40 different clones, and purchased new land for vineyards specifically designated for estate varietal wine grapes. The four estate Pinot Noirs are distinctly different due to site-specific terroir. Gravel Knob and Rust Rock Terrace are vineyard-designated wines produced from the 128-acre Circle Bar Ranch Vineyard and the 207-acre Home Ranch Vineyard. 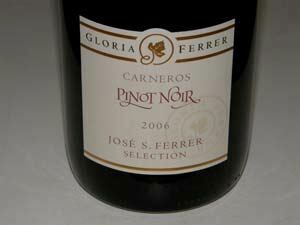 The José S. Ferrer Selection Pinot Noir is a blend of the best blocks from the estate vineyards. 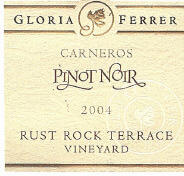 The Carneros Pinot Noir is a blend from many different soil types, terrain, clones and selections. The winery produces seven diverse sparkling wines from over 50 individual wine lots as the blending palette. The wines take two to ten years to produce. They have been consistently excellent, among the best for their price level in California. The winery was Wine & Spirits Magazine Winery of the Year in 2013. Gloria Ferrer is located in the picturesque Sonoma Carneros region and the winery’s sun-drenched Vista Terrace overlooks breathtaking estate vineyards—providing the perfect place to enjoy a glass of sparkling or still wine with the savory Spanish and local cheeses, meats, almonds and other delicacies that are available from the tasting room. The tasting room is open daily from 10:00 a.m. to 5:00 p.m., with wine service available until 4:45 pm. 707- 933-1917. Guided tours are available of the production facilities and cave overlooks.The sparkling wines enjoy wide retail distribution, but the still wines are only sold at the winery. Multiple wine club options are offered.